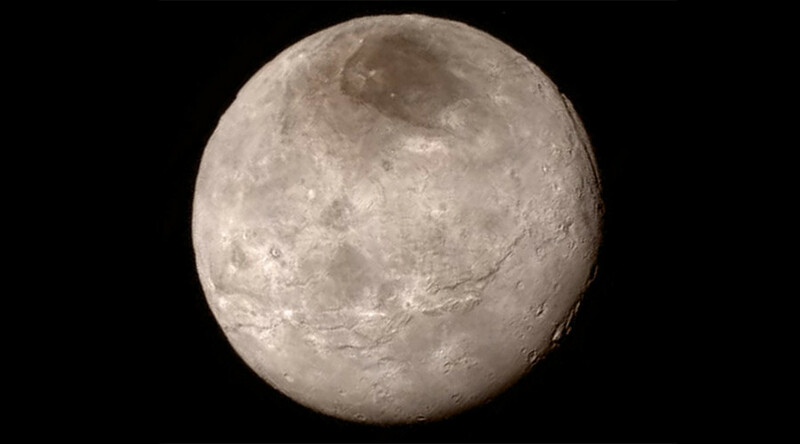 The US space agency has revealed an image of Pluto’s largest moon Charon which has a vast dark area on its north pole. The enigmatic zone was immediately dubbed by Tolkien-inspired scientists as ‘Mordor’. “In Charon’s north polar region, a dark marking prominent in New Horizons’ approach images is now seen to have a diffuse boundary, suggesting it is a thin deposit of dark material,” NASA said in its press release. Cathy Olkin, one of the mission’s top planetary scientists, was not that official at the Wednesday press conference that revealed the historic image. “You see the darkish area that is at the north pole. Informally we have been referring to that as Mordor,” she said to everyone’s delight. The ‘Mordor’ photo was taken by NASA’s New Horizons spacecraft on July 13 from a distance of about 466,000 kilometers. A canyon at upper right of Charon that can be estimated to be 7 to 9 kilometers deep can be clearly seen in the picture. The scientists are surprised by the apparent lack of craters on Charon. Discovered in 1978 Charon was named after the ferryman of the dead in Greek mythology. Its diameter is 1,208 km, just about a half of Pluto’s. Charon’s images were taken along with the dwarf planet, as well as its four smaller moons: Nix, Hydra, Styx and Kerberos. New Horizons spacecraft travelled more than nine years to reach Pluto after it was launched from Cape Canaveral on January, 19, 2006. It covered the distance of more than three billion miles to reach the dwarf planet and its moons which lie on the outskirts of our solar system, but as the spacecraft has no breaking mechanism it will continue its way into the Kuiper belt.